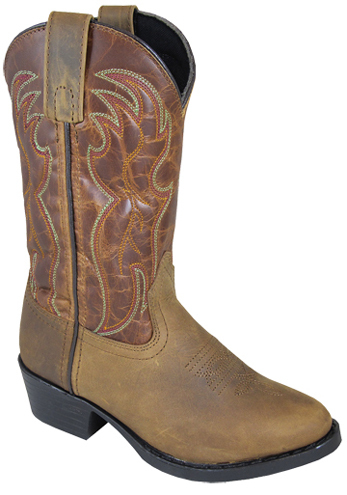 Basic Western cowboy boots might be hard to find, but Cultured Cowboy has plenty of this favorite distressed brown "Tonto" boot. Real leather upper with a soft Tricot lining and rubber sole makes this style easy on your feet, and the price is easy on your wallet! Injection molded rubber sole and Tricot liner allow flexibility when playing in your child's boots. Leather outer allows the feet to breath, and the boot to shape to your children's feet. Did you know that the reason for the stitching on the foot is to help the leather break in properly? It is there to insure that the leather wrinkles in the right place instead of hurting little toes.